The Extron DA HD 4K PLUS Series are HDCP 2.2 compliant distribution amplifiers for HDMI signals at resolutions up to 4K/60 @ 4:4:4 chroma sampling. They support data rates up to 18 Gbps, HDR, Deep Colour up to 12-bit, 3D, and HD lossless audio formats, along with integrator-friendly features such as automatic input cable equalization, automatic Colour bit depth management, and selectable output muting. They also feature Extron EDID Minder® and Key Minder® technologies to maintain continuous EDID communication between connected devices and ensure simultaneous distribution of HDCP-encrypted content. The DA HD 4K PLUS Series distribution amplifiers are available in sizes from two to six outputs, and are ideal for applications that require reliable distribution of a single HDMI source signal to multiple displays. To enhance and simplify integration, the DA HD 4K PLUS Series offers many integrator-friendly features. Input cable equalization restores and reshapes incoming HDMI signals, reducing the need for additional signal conditioning equipment by compensating for weak source signals or signal loss from a long input cable. Colour bit depth is automatically adjusted based on the display EDID, which prevents Colour compatibility conflicts between source and display. Also, outputs can be muted independently via RS‑232, allowing content to be previewed on a local monitor. 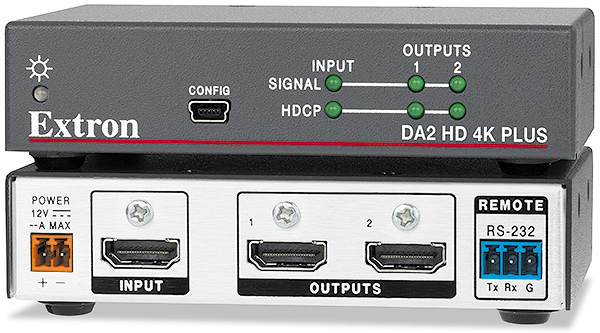 The DA HD 4K PLUS distribution amplifiers provide immediate visual confirmation of HDCP authentication and signal presence for each port via front panel LED indicators. If HDCP‑encrypted content is transmitted to a non‑HDCP compliant display, a full‑screen green signal provides immediate visual notification that protected content cannot be viewed on that display. HDCP authorization is user-selectable, allowing the unit to appear HDCP compliant or non‑HDCP compliant to the connected source. This is beneficial if the source automatically encrypts all content when connected to an HDCP-compliant device. The DA HD 4K PLUS Series distribution amplifiers also provide +5 VDC, 250 mA on each output for powering peripheral devices such as an Extron HD 4K 101 Plus cable equalizer. The DA2 HD 4K PLUS is housed in a 1" (2.5 cm) high, quarter rack width metal enclosure that can be mounted in a rack or discreetly installed beneath a desk. It includes an external, universal power supply for worldwide power compatibility. The DA4 HD 4K PLUS and DA6 HD 4K PLUS are housed in 1U high, half rack width metal enclosures, are rack‑mountable, and are equipped with internal universal power supplies. Support for HDR – High Dynamic Range video - These products provide the video bandwidth, Colour depth, and metadata interchange capability required to support HDR video signals. HDR provides a greater contrast range and wider Colour gamut. HDCP 2.2 compliant - Ensures display of content-protected media and interoperability with other HDCP-compliant devices. Automatic input cable equalization - Actively conditions incoming HDMI signals to compensate for signal loss when using long cables, low quality cables, or source devices with poor signal output. Key Minder® continuously verifies HDCP compliance - Key Minder authenticates and maintains continuous HDCP encryption between all input and output devices to enable simultaneous distribution of a single source signal to two or more displays. Selectable output muting via RS‑232 - Provides the capability to mute one or all outputs at any time. This allows content to be viewed on a local monitor prior to appearing on the main presentation display. User-selectable HDCP authorization - Allows the unit to appear HDCP compliant or non‑HDCP compliant to the connected source, which is beneficial if the source automatically encrypts all content when connected to an HDCP-compliant device. Protected material is not passed in non‑HDCP mode. HDCP Visual Confirmation - When HDCP‑encrypted content is transmitted to a non‑HDCP compliant display, a full‑screen green signal is sent to the display for immediate visual confirmation that protected content cannot be viewed on that display. Automatic Colour bit depth management - The DA HD 4K PLUS Series automatically adjusts Colour bit depth based on the display EDID, preventing Colour compatibility conflicts between source and displays. HDMI to DVI Interface Format Correction - Automatically reformats HDMI source signals for output to a connected DVI display. HDCP authentication and signal presence LED indicators - Front‑panel LED indicators for signal presence and HDCP authentication provide real‑time feedback and monitoring of key performance parameters. RS‑232 control port - Enables the use of serial commands for integration into a control system. Extron products use the SIS™ - Simple Instruction Set command protocol, a set of basic ASCII commands that allow for quick and easy programming. Front panel USB configuration port - Enables easy configuration without having to access the rear panel. Easy setup and commissioning with Extron’s PCS – Product Configuration Software - Conveniently configure multiple products using a single software application. Rack‑mountable, metal enclosure - The DA HD 4K PLUS Series two-output model features a 1” (2.5 cm) high, quarter rack width enclosure. Four and six‑output models feature a 1U high, half rack width enclosure. Extron Everlast Power Supply - Provides worldwide power compatibility with high reliability and low power consumption for reduced operating costs. Two-output model requires external power supply, included, replacement part #70-1175-01. Four and six-output models are equipped with a 100-240 VAC, 50/60 Hz, internal universal power supply.